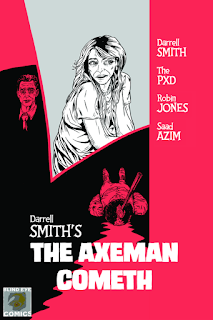 The Fellowship was fortunate enough to obtain a copy of THE AXEMAN COMETH from Blind Eye Comics. Darrell Smith writes, The PXD draws, Saad Azim colors, and Robin Jones letters. Flint is a private eye in Chicago in the roaring 20s. His partner Brick tips him off to a murder case in Louisiana – a well-to-do lady wants an investigation of the brutal murders of her husband and some other family members. This leads Flint to a string of seemingly unrelated axe murders through the South, and a murderer taunting him through the mail. This crime noir story set in the Deep South has some really interesting layers to it. It’s set in the 1920s with Flint being from Chicago, giving it that strong noir feel. But things work differently in the South, with the locals seeing and treating Flint as strange. And I don’t want to spoil the twist ending, but it adds another very cool layer to the whole. And the art does nice work with reflecting the setting, and the coloring also helps with the “old-timey” feel of the book. It’s great to see an indie comic dive into the crime genre so effectively, and to see it use the comics medium to delightful effect. I can’t wait to see what these creators come up with next. THE AXEMAN COMETH is available now online at blindeyecomics.weebly.com.